After a few of days of recovering from the previous week’s plunge, the market again turned bearish in the later half of the week as investors got defensive. For the week, the Dow Jones actually gained +0.4% as the S&P 500 rose fractionally, successfully snapping a three-week retreat while the Nasdaq shed -0.6% to extend losses into a third week. 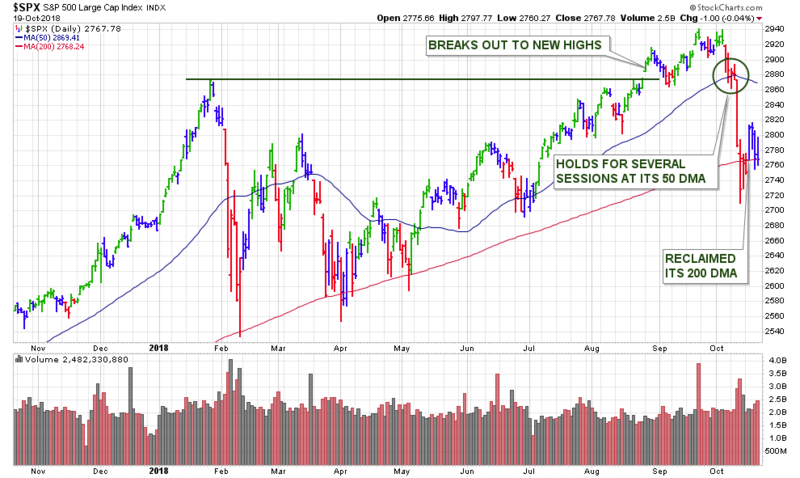 The S&P 500 and Nasdaq Composite whipsawed at the 200-day moving average — S&P 2,768, and Nasdaq 7,517,respectively — areas that remain bull-bear inflection points. 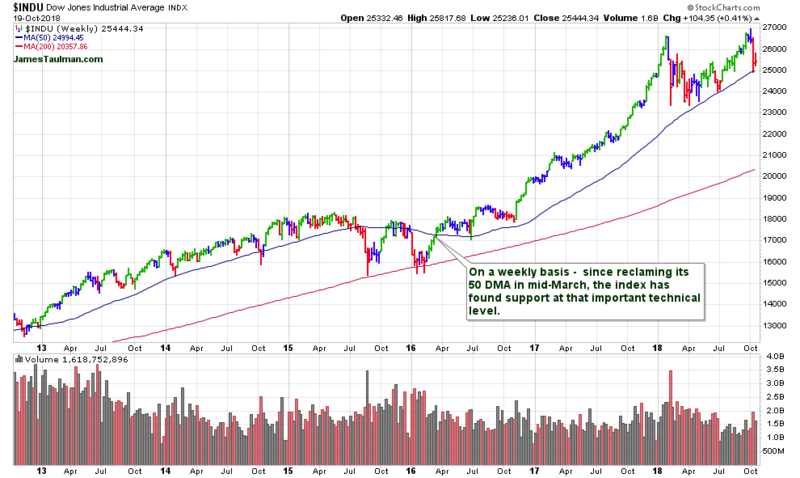 In individual stock analysis, I regularly talk about and use the 50- and 200-day moving averages as areas of support. The 50-day moving average is very often used as our 2nd SUPPORT level for any breakouts. In the charts below we can see the same moving averages come into play for the major indexes as well. 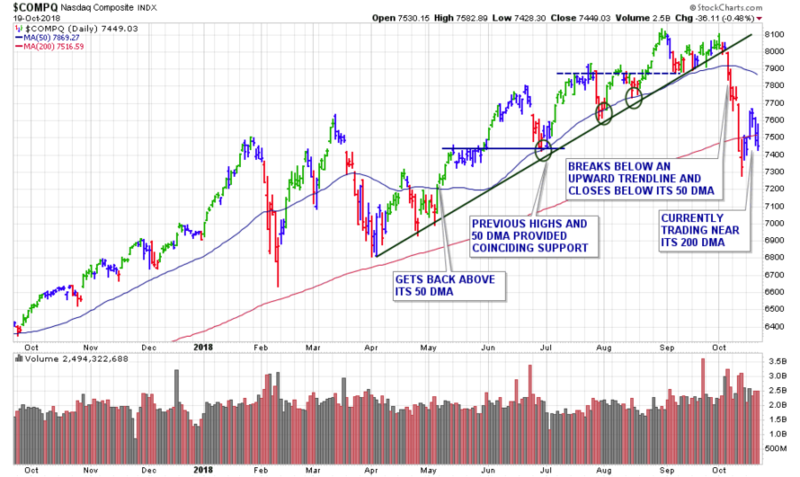 After the markets pulled back sharply the previous week, I assembled a watch list on Sunday of 33 stocks which pulled back, yet remained above logical areas of chart support. I noted that these stocks could start to move higher especially if the market could continue to advance from Friday’s bullish reversal. A majority of those 33 stocks followed the direction of the broader market this past week. Each posted an initial gain sometime during the first half of the week, yet many pulled back along with the indexes before week’s end. – see complete update here. From the watch list in last week’s Sunday Stock Report, we had 0 breakouts this past week. Fittingly so.